Tokyo, December 8, 2017 – Subaru Corporation today announced that the Insurance Institute for Highway Safety (IIHS; a nonprofit organization supported by auto insurers in the US) has awarded the 2018 TOP SAFETY PICK (TSP), along with the highest possible rating of “Good” for five crashworthiness tests as well as “Superior” for front crash prevention to the 2018 Subaru Impreza, Crosstrek*1, Legacy, Outback*2, Forester and WRX currently sold in the North American region (when equipped with Optional EyeSight). 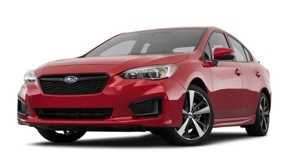 In the headlight evaluations, Impreza, Legacy, Outback and WRX received a “Good” rating, Crosstrek and Forester received an “Acceptable” rating, respectively (when equipped with specific headlights). To earn the TSP award, a vehicle must have good ratings in all five IIHS crashworthiness tests – small overlap front, moderate overlap front, side, roof strength and head restraints – an advanced or superior rating for front crash prevention and an acceptable or good headlight rating. *1: Models built after October 2017. Called “Subaru XV” in markets outside North America. *2: Models built after September 2017.